Hellhookah is a Lithuanian two piece doom metal outfit rooted in the ways of classic, traditional doom. Guitarist and vocalist Arnas and drummer Gintarė founded the band in 2012 and began playing living shows in 2014. Nearing the end of 2015, the band is getting ready to drop their debut album, Endless Serpents, which features seven tracks of trudging doom, one which is a cover Saint Vitus’s classic “Born Too Late”. The band’s style borrows heavily from the likes of doom titans Pentagram and Black Sabbath as well as the psychedelic, stonerized styling of Cathedral and Trouble. It’s a sound that hearkens back to the early days of heavy metal and one that Hellhookah approaches with aplomb. Arnas brings a trunkload of stomping, fuzzed out riffs while Gintarė trudges out the paces with a simplistic yet effective style. The music shifts from slow paced crawling of “The Overman’s Eye” to the classic rock tinged, Orange amp tones of “The Way” to the crushing traditional doom of “A Storm in the Hidden World”, offering a wide variety despite sticking squarely within their niche. Arnas does a bang up job with the vocals, sounding like a relic of the past with a mid-range style that rests between crooning and shouting. Despite the album’s sultry charm, Hellhookah would benefit immensely by adding a bassist to their ranks. The deep rumbling and fuzzy tones of the riffs bring a solid low end, but traditional doom is a style that revels in having meaty bass lines mixed throughout. A few guitar riffs feature psychedelic leads over the main riff, but I can just imagine what it would sound like with a complete rhythm section. There are a few moments that plod along for a little too long before hitting their stride, but overall Endless Serpents serves as a great tribute to the classic doom bands of the past. Reveling in the stuff of the past, Hellhookah’s sound is should please fans of the doom revival. This duo brings a little more in the way of classic rock influence than some of their contemporaries, but it seems to give the band an edge. 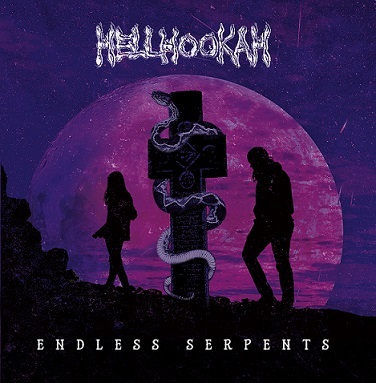 Full of catchy yet crushing riffing and solid percussion, Endless Serpents is a fantastic debut from Hellhookah and one that should see the band getting some well-deserved attention. This entry was posted in Reviews, Stoner, Doom, Sludge, Unsigned Reviews and tagged black sabbath, Cathedral, classic rock, doom metal, Endless Serpents, Helhookah, Pentagram, psychedelic, Reverend Bizzare, saint vitus.